I am Getting A Head Start on Cinco de Mayo, my dear readers! Or perhaps it is because I have several projects going on at the same time here at “Villa de la Luna” that Mexican food is a fast and easy meal to prepare. Or perhaps it is all of the above. 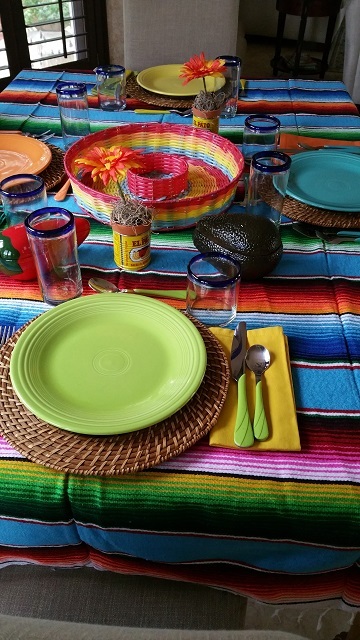 Never-the-less, I feel so festive when setting a Mexican tablescape. I play Tex-Mex music and dance around the dining table with maracas in my hands. OK, …TMI, or too much information. First an update on the projects that are taking more time than I wanted to commit to….but isn’t that always the case? More time and more money than expected is usually the norm…at least in my case it seems. The master bedroom is almost ready for a reveal….it took two coats of paint on the walls, three coats of paint on the crown molding, doors and baseboards, three coats of white chalk paint to cover the dark stained wood of our bedroom furniture and a lot of speculation on re-arranging the furniture and lighting etc. This rustic barn wood with the Too Much Summer is a Beautiful Thing fits in perfectly with the coastal look I am going for. It hangs on a wall near the bed. It is coming together and I will post the Master Bedroom reveal very soon. The newest project is the make-over of one of our guest rooms into my office/studio/staging/craft/gift-wrapping/sewing and of course Blog writing centers! Just a few of the multi-tasking this former twin bed guest room will now partake of. This bedroom has been home to grand-children and children, but most of the time our guests are in what I call the second master bedroom with the ensuite bathroom. So the guest bedroom usually sits idly waiting for guests….but now I am giving it new life as I will be in there most of every day and I am excited to remove all my Blogging stuff from the desk in the kitchen to it’s own private room. The above pic is a sneak peek at something I have always wanted…a gift wrapping center….The Captain put it together last night and hung it for me this morning above one of my work stations. (hint! There is more than one work station) I LOVE IT!!! No more searching for tissue paper, etc. It will all be in one place. I can’t wait to finish filling it up when I round up all my wrapping paper and ribbons. The little baskets hold name tags, tapes, scissors and all sorts of goodies for wrapping packages. More to come on both of these projects at a later date…promise! Back to getting a head start on Cinco de Mayo. In an earlier post…a couple years ago, I posted about Cinco de Mayo with an explanation of this “Holiday”. Click on the below if you would care to read it. After living in New Mexico for so many years, I crave roasting green chiles, plucking dried red chiles from a Ristra hanging at my door and making Pinto beans an almost daily dish. But I also like keeping things simple, such as this one pot Taco Salad. 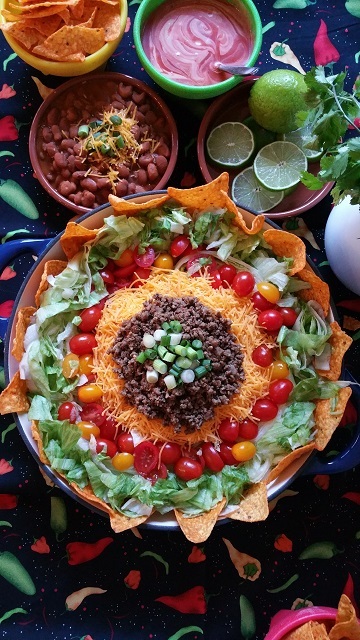 Perhaps you remember this recipe for taco salad….the recipe is at the following link,…I love serving it in my large Blue enameled cast iron Brazier Pan. Who doesn’t love Fiesta ware? 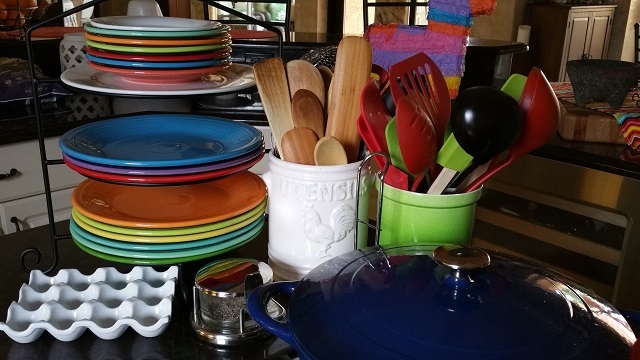 You might remember these dishes from the 50’s….but these are my everyday dishes…. of which I am fortunate to have a 20 place setting. These sturdy plates and cups have survived children and grandchildren and yet they live on. 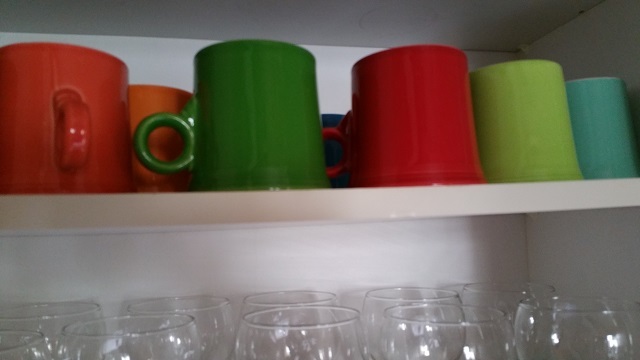 Some colors of my collection are no longer made, but they do not get preferential treatment in my kitchen. I have a black metal Dinner Plate Stand next to my gas stove top that makes it so convenient when cooking for two…or three or four or more. It does get moved around on counters, etc from time to time. 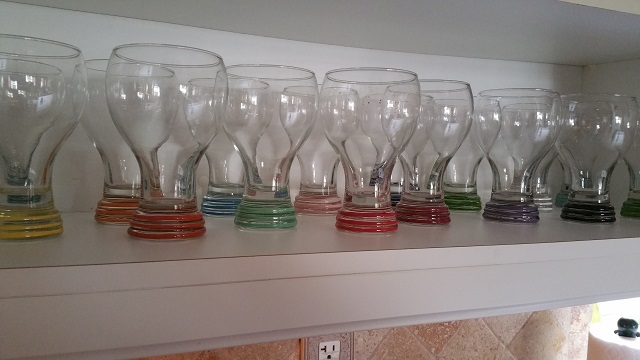 I drink from the cups every single day and I must share that the matching glasses in my cabinet are definitely antique as they are no longer manufactured….they are really an odd looking… almost soda fountain shape with the stripes at the bottom of the glass matching the plate colors. 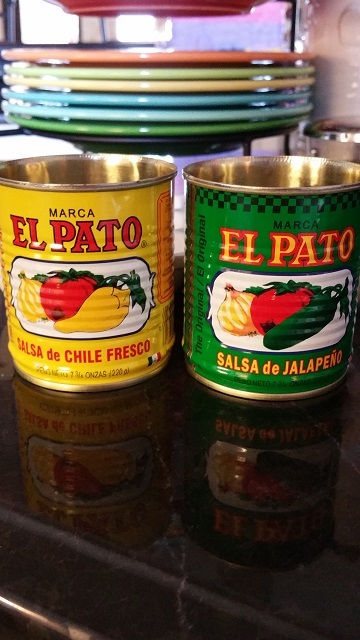 Although the manufacturer of Fiesta ware provides a matching flatware….the flatware I have is no longer produced. 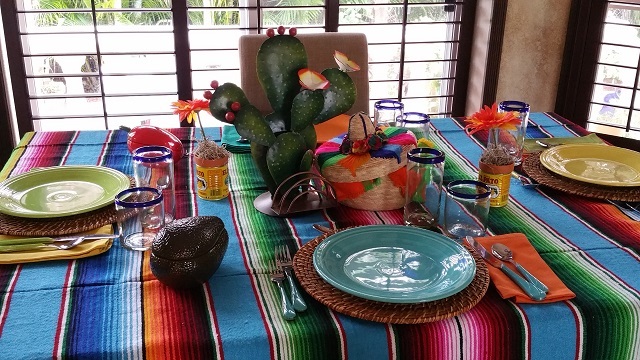 However, for this table setting, I will be using glassware that I purchased many years ago on a trip to Mexico (while living in New Mexico)….along with a serape-type tablecloth. 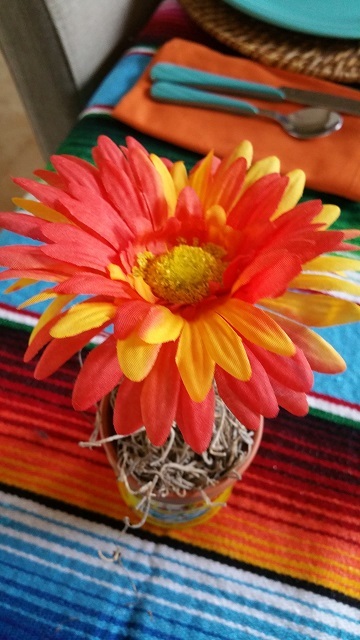 a centerpiece cactus and two orange daisies in little cans. 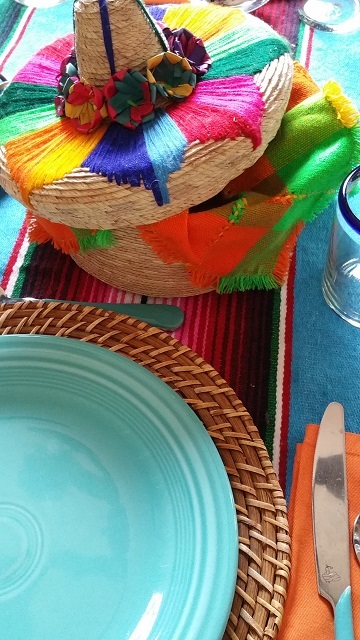 The colorful sombrero holds soft tacos or taco chips. 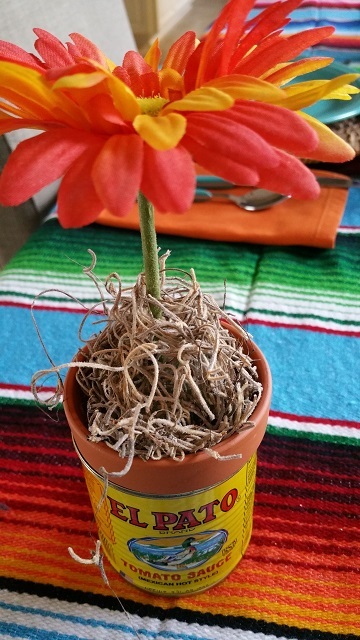 I love to use whatever Mexican decor I happen to have hanging about and these little empty cans (they originally held tomato sauce) provide a great vase for the colorful Mexican Daisies. Aren’t these simple and cute? Yes, I do love Mexican food and so does my Captain! 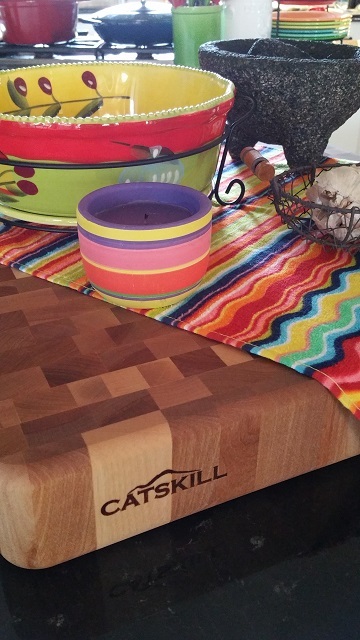 And I love celebrating Cinco de Mayo…even if it is 15 days early! Do you my dear readers, have a favorite type of food that you fall back on? « MY Flower Petal Dishes For An Easter Tablescape Is Always Fun!